I've been hearing for years that Muddy and Bridge are great DPS peaks, so when I heard Linda and her long-time friend Eve were headed that way I sort of invited myself. We drove the scenic route from Bishop through Death Valley, easily reaching the trailhead in half a day. 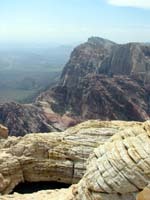 The excellent BLM web page describing Bridge Mtn vanished in 2010 (let me know if you can find the new URL). I won't try to give a blow-by-blow climbing description because that's been done before! All photos are courtesy of Eve Laeger, route lines added by Steve Eckert. The passenger car 'trailhead' is waypoint WILLOW, where the pavement ends. 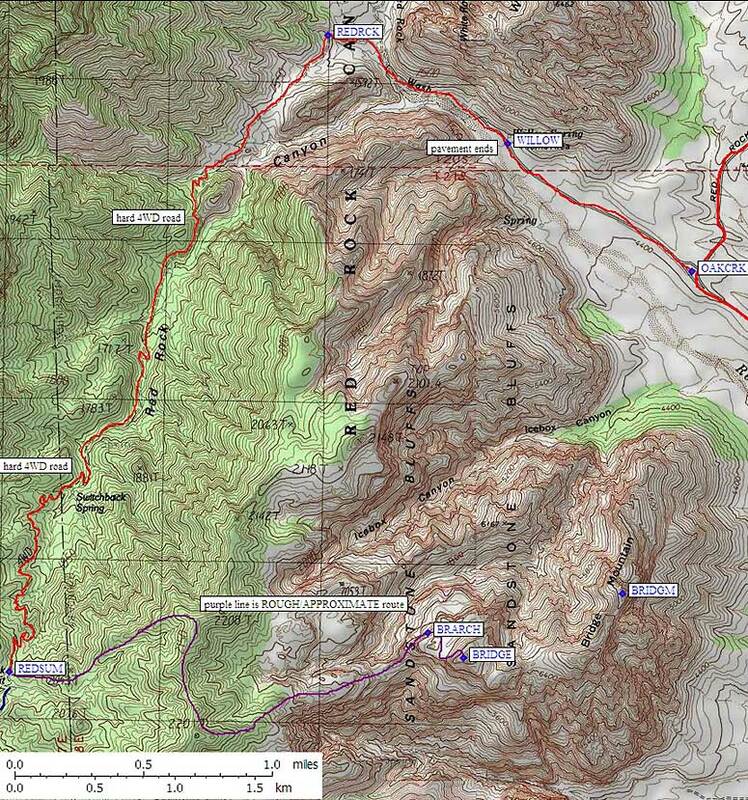 It's 19 miles from here to the summit and back, according to the BLM. 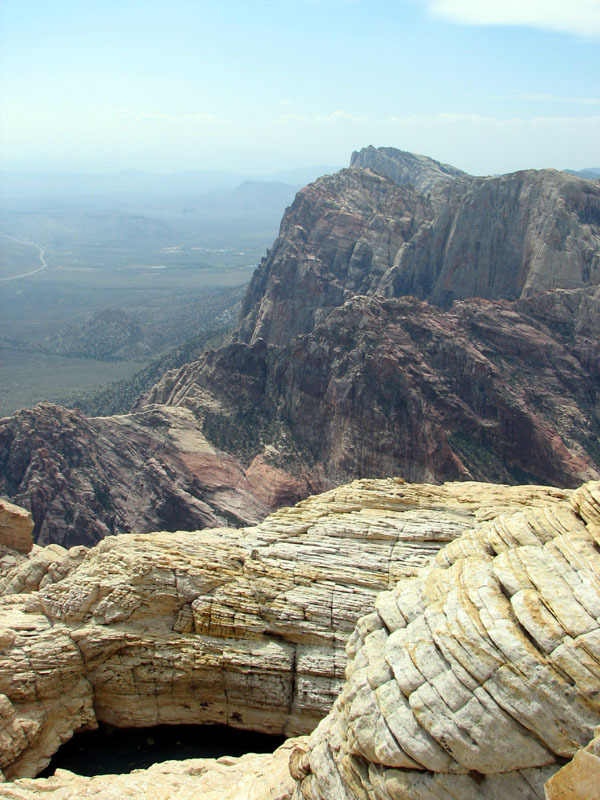 You'll need a good 4WD to get to what the map calls Red Rock Summit (and the BLM calls Rocky Gap). They say you need a permit to camp here, but I'm guessing they don't patrol very often and we wished we had done the 4WD part the night before. There are a few use trails but the main trail is well maintained and has reasonable signs at first. Refer to the purple line on the hiking map below - I didn't take any waypoints so I'm not sure this is exactly right, but it's close enough. (If anyone has a better route line, please send it to me and I'll update this map.) 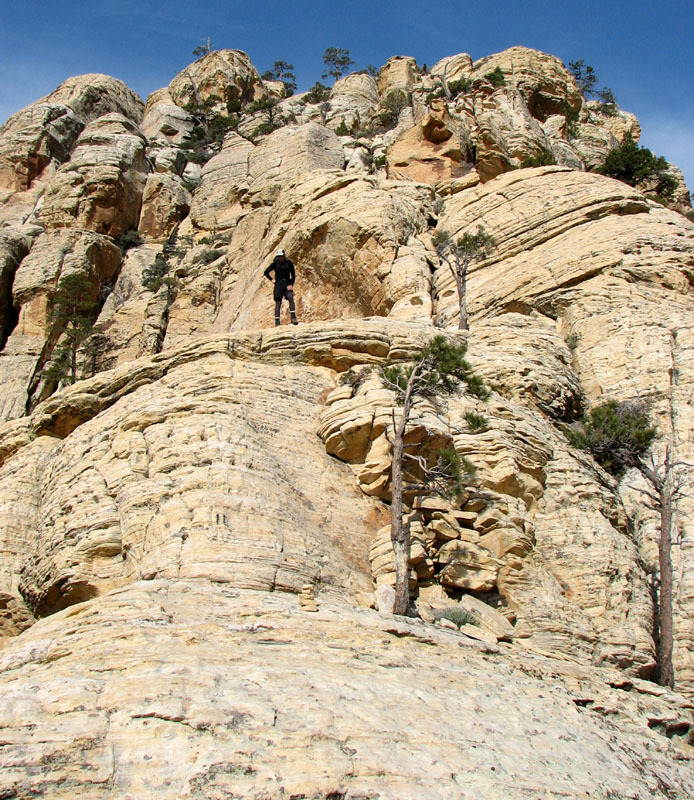 You're in the trees until you drop east from the ridge out onto the Sandstone Bluffs. That's where it gets good! Gary Craig adds: "On my most recent ascent, I noticed that the 'official' trail had been re-routed around the west and south sides of point 2201, where you start dropping down the ridge to the east. There was still evidence of the older trail, which makes a more direct route across the NE side of 2201, but the rangers had definitely been at work trying to hide the older route with brush and rocks and such. Your map corresponds closely to this older route... perhaps you just chose to go that way, or perhaps the trail has been re-routed again." I should mention that the map shows Bridge Mtn in a very different place than we all climb. We climb to waypoint BRIDGE, but the USGS and the topo maps label waypoint BRIDGM, which is lower and way east. We're actually climbing the high point of what the map labels as "Sandstone Bluffs", not Bridge Mtn. 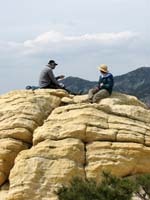 Once on the sandstone, look for black painted lines. We missed most of them on the way in, thinking they were lichens or something. There are some rock ducks, but the painted lines are better clues. You'll do some 3rd class moves getting down to a big saddle, and you'll need to route-find a bit, but keep looking back at the incredible views and the time will fly. 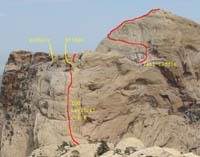 From the saddle you go up what is often called a 100' vertical crack. It's not vertical, and you don't have to climb the crack. 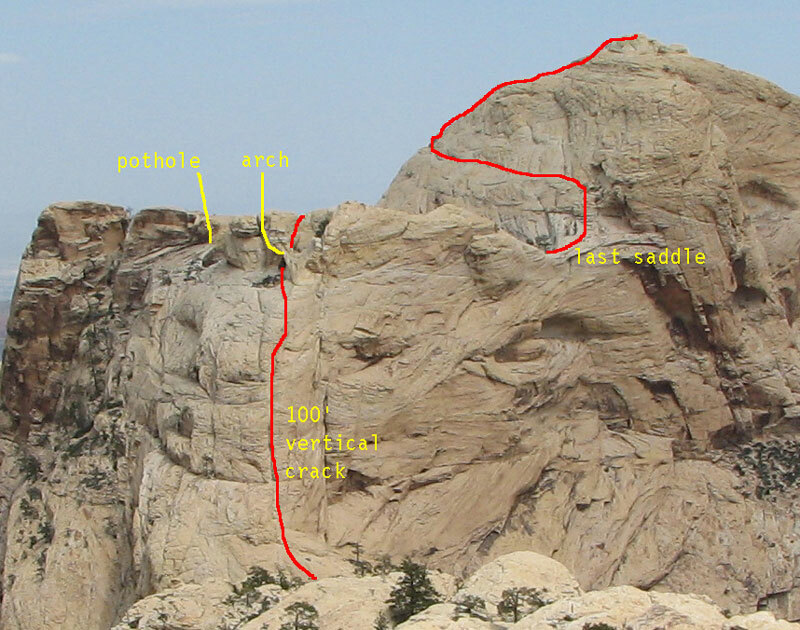 I got out of the crack and went up the right (south) side where the painted lines indicated I should, but coming down I stayed entirely out of the crack on moderate friction that frequently had good holds. We didn't use a rope here, and I don't see why anyone would. 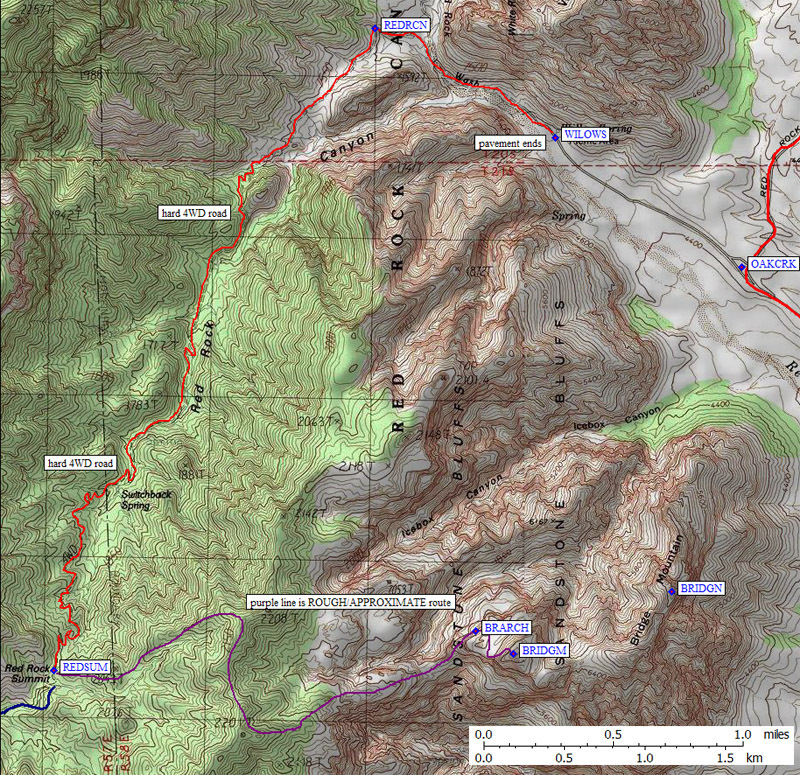 See below for a detailed map of our hiking route with GPS Waypoints. Above the crack the route goes left to the coolest part of this peak: You actually pass through a bridge or arch (waypoint BRARCH) and climb a 'pothole' wall next to a huge leaning (fallen) tree. Friction on this wall is good but if you blow it you'll end up in the water. Linda wanted a belay on the way down, and Eve tied off to the top of the fallen tree. 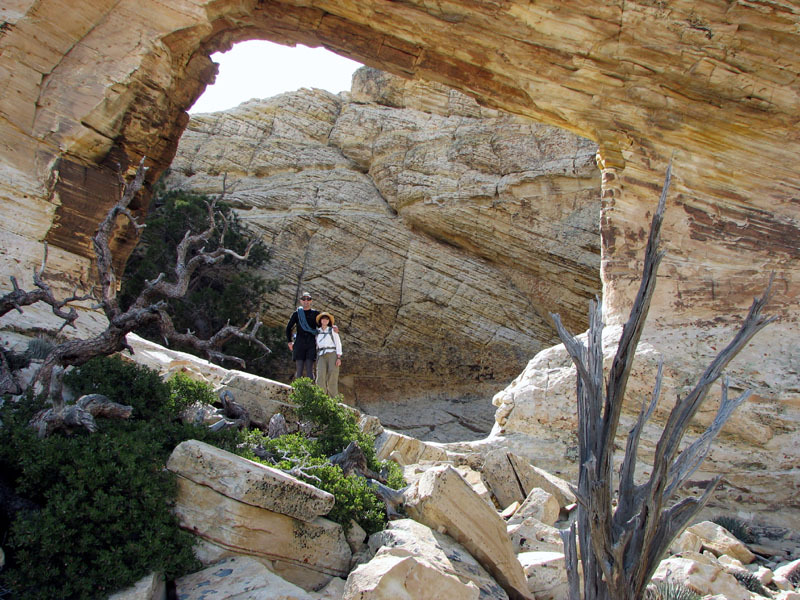 If you pass by the arch on the left and keep going, you can visit another, deeper, pothole before coming back through the arch to finish the climb. 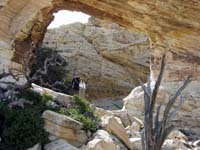 Gary Craig adds: "I'm surprised you climbed the slabs next to the dead tree behind the bridge. It is pretty easy to get up on top of the bridge itself, walk across it (right to left, as you initially approach it), and make your way around to above the tree. Fun, and easier than the friction slab! " Above the arch you can go look down at the larger pothole, or turn right to go up and across to the last saddle... next to an improbable large patch of dirt with good sized trees that would make an EXCELLENT campsite if only you had water. There seem to be two summit routes from here: One goes more or less straight to the summit, very steep with meager holds. The other is far safer, traversing far to the left on a defect that creates a not-really-level ledge system. The ledges keep going until the slope to the peak (on your right) is a low-angle scramble. It's worth spending some time on the summit. Good views of Vegas, minor potholes, acres of slick rock (bare sandstone), and in our case some gathering clouds that ended up not doing anything. 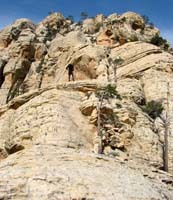 The rock is very unique, the views down into side canyons (like Pine Creek) are stunning, there are little lakes perched in sandstone depressions, and above all the climbing is interesting and at times challenging. Even if you sight-see this shouldn't be a long day. Enjoy yourself!